How to Delete a Windows Service: In the following simple solution, I will show you how to remove a no longer active Windows Service. Typically installed by programs that utilize automatic functions, Windows Services essentially run executables in a non-interactive manner. In many cases, the uninstaller that ships with a program does not remove the Windows Service it installed. However, as long as the Service is stopped, removal is relatively simple. (1) Locate the name of the service you wish to delete and make sure its status is not started. If it is, stop it. 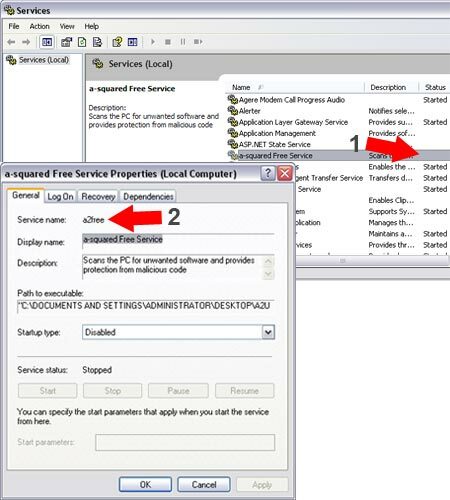 (2) Right Click the service and select properties. Make note of the Service name. That’s all there is to it. If all went well, the service should now be removed from Windows.